Lately, the traditional jack-o’-lantern is being replaced by more glamorous pumpkin decorating, so I easily and happily embraced this trend. Few days ago I picked up another big jack-o lantern pumpkin at my nearby grocery store, and this time instead of chopping it up and making it ready for my cakes, pies and soups, I decided to give it a glam makeover. I wanted to incorporate thumbtacks in my pumpkin decor. I already had a few which were a left over from another project. I also had white and gray spray paint cans, and I thought this color scheme would be a perfect match for the high gloss nickel thumbtacks. The pumpkin I picked was flat in one side, so this imperfection gave me an inspiration for my design. 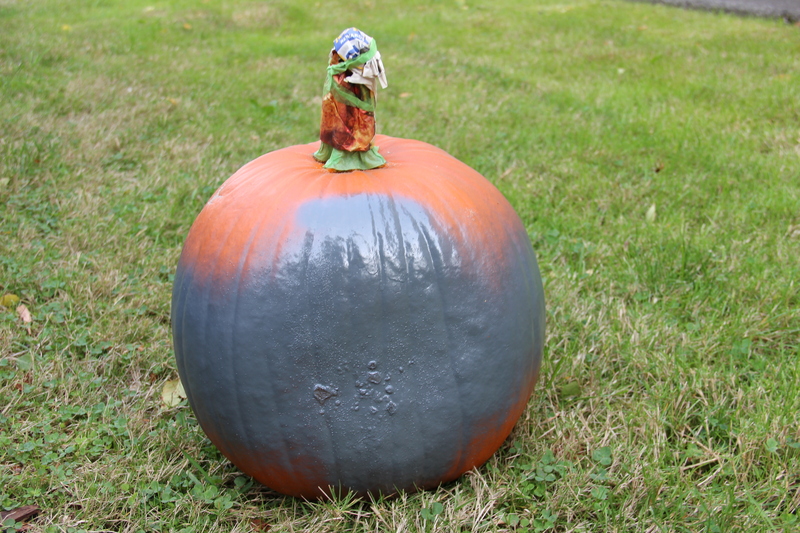 The whole design idea of my painted jack-o-lantern evolves over the flat side of this pumpkin. After taping off the stem I spray painted gray the flat side, and continued with a 4 inch line all around the center of the pumpkin. In order to proceed with the white color I made a pattern, as shown below, from the kitchen towel paper to cover the gray which I originally wanted to be shown on the design. Something went wrong, and while removing the paper towel the gray paint peeled off in some spots, so I had to cover this with what I had at hand. As you can see it was a black glossy paint, another left over can of paint from my porch railing project. Luckily, it turned better than I expected, even though I was not as precise as I should have been while covering the gray. However, the thumbtacks take away the attention from the sloppy job done with the black, so all in all it turned out nice. 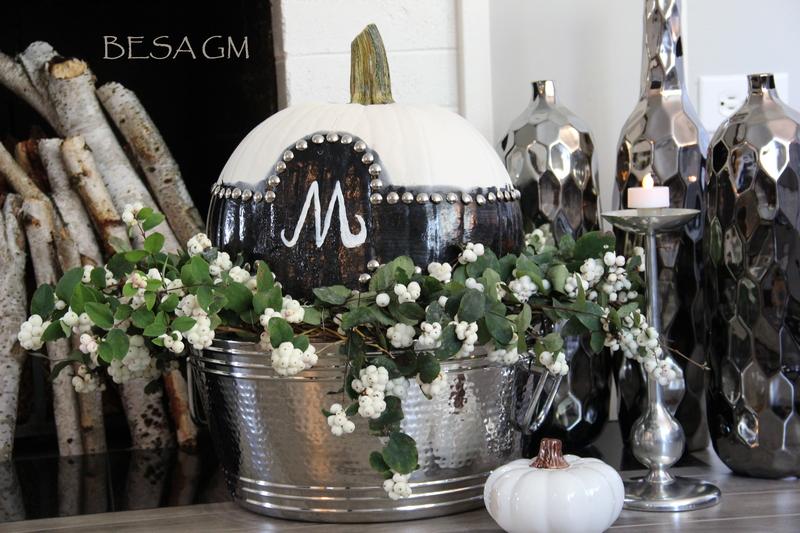 After placing the thumbtacks, I used white french manicure nail polish to “engrave” our monogram “M”, and the glamorous pumpkin was ready to take the stage. I placed it in an ice bucket, and surrounded it with a hand made wreath of fresh cut snowberries. I like these juicy white pearl like berries, and I wanted to incorporate those in this year’s fall and holiday decor. 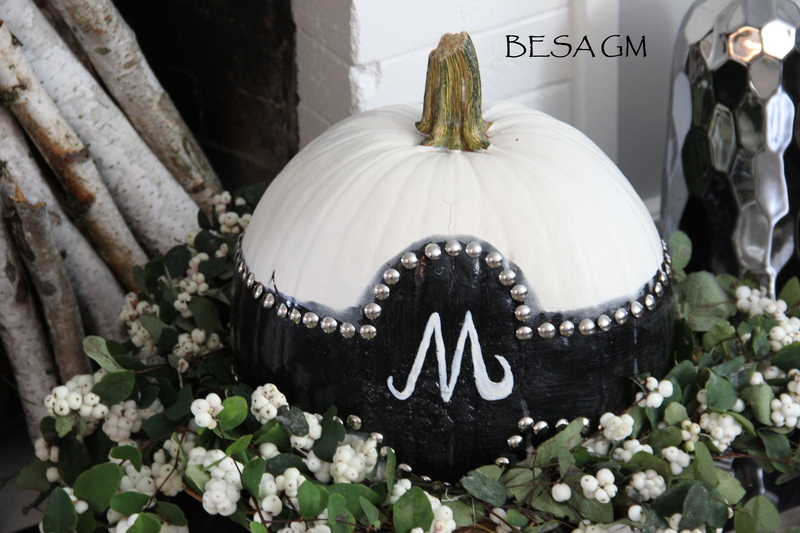 Who would think that a pumpkin can add a touch of glam to a place or setting. Well this is a prove that it can, so do you feel like swapping pumpkin orange for another color this fall? 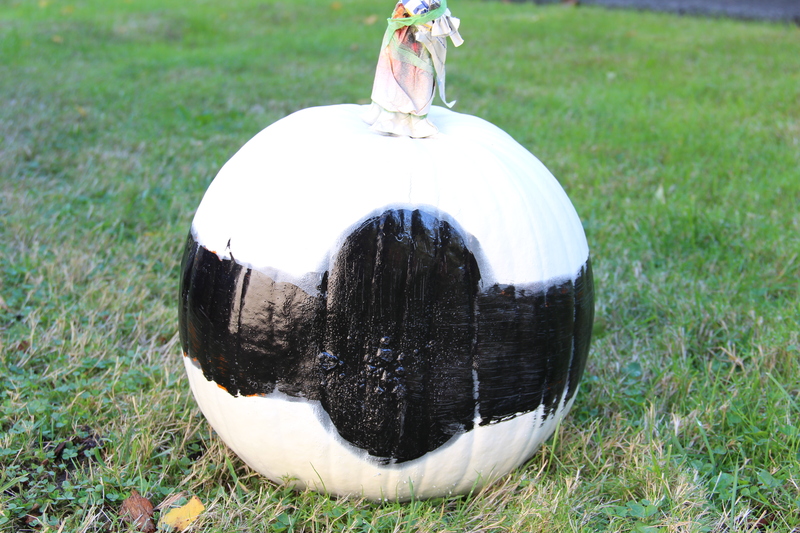 If so then try this glamorous pumpkin makeover. I LOVE how it turned out. The way you have displayed it looks like it should be in a magazine. NICE JOB! Hi Danielle,Thank you for hosting the link party, and for your comment. I like your blog a lot, and l am looking forward to come back again. I love your “chic” spin on fall decorations! I’m happy I found your blog through this week’s linky. You have some really beautiful ideas that I would never have thought of! Thank you very very much for your comment Sandy, it made my day. You and your sister behind your Everyday Southwest are so talented and accomplished, and your recipes seem to be delicious. Great photos too. Thanks again for noticing my post and checking it. What a modern and unique pumpkin! Thanks for sharing this idea! Thank you very much for checking my post, and for your comment Tammy. It looks very nice! I never would have known that “something went wrong” if you hadn’t said so. Very nice job and a neat idea! Thank you very much for liking my pumpkin decor idea. I love your spooky bottle labels, and I am looking forward to incorporate them in my Halloween decor. 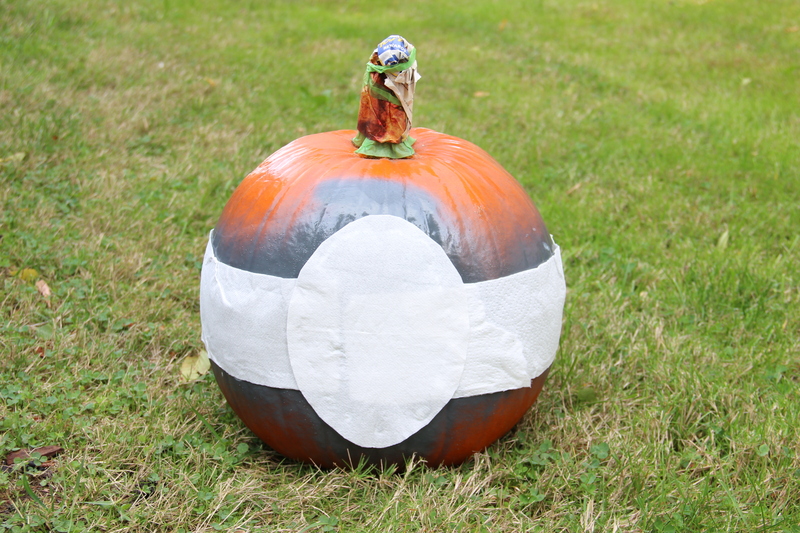 Such an amazing looking pumpkin! I love it! I found you at the Weekend Wonders party. Thank you very much for stopping by my blog and your comment on my pumpkin decor idea. 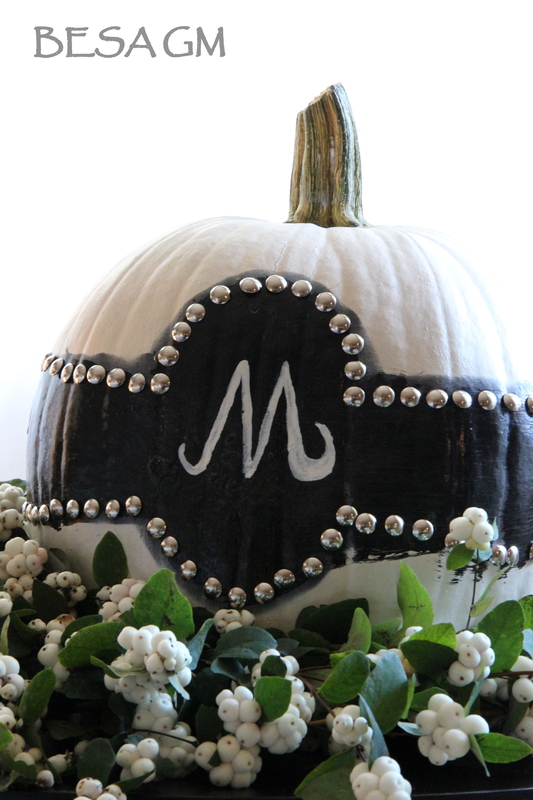 This is a Glam pumpkin indeed! Thanks for sharing how you made this on TTF! Thanks to you and Diann for hosting a great TTF linky. I appreciate that you noticed my post among all those other amazing projects. Lovely pumpkins, have a nice day. Thank you Louisette. I appreciate your stopping over! Thanks for the compliment and for hosting the party. Your glam pumpkin looks so cute in the ice bucket. Great job! Thanks for sharing it with SYC. Thank you for hosting the SYC and for noticing my pumpkin post. You have sucn an interesting blog: a lot of treasures and such a knack for putting them all together and making them look fabulous! I appreciate your comment Kathy,and thank you very much for hosting the link party. Pretty! I’d love to have you share this on The HomeAcre Harvest Hop today! Thank you for the invitation Lisa. I will do it right away. This is simply beautiful! Love everything about it. This will be one of my features from the blog hop so don’t forget to grab you ‘featured’ button on Sunday! 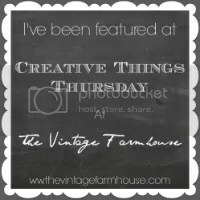 Thanks SO much for sharing at the Frugal Crafty Home Blog Hop! Thank you for hosting another great party Katie. 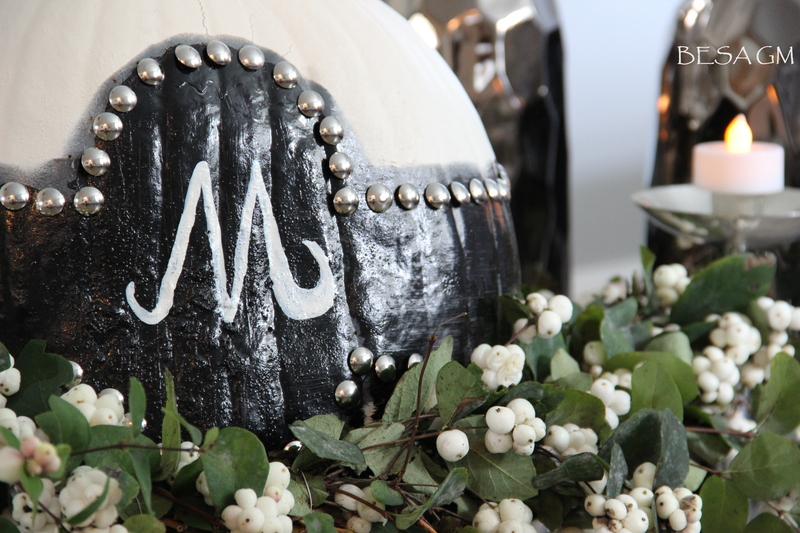 I am so happy that you liked my Glam Pumpkin Decoration, and thank you very much for featuring it. Very creative twist on the jack-o-lantern. Thank you for sharing at the HomeAcre Hop; I hope you’ll join us again this Thursday. Thank you for the compliment Kathi.